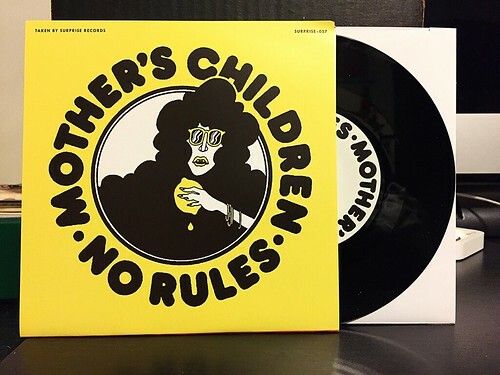 I Buy Way Too Many Records Dot Com: Mother's Children / Mandates - Split 7"
I'm not sure if I'm just buying fewer 7"s this year or if we're starting to see a down tick in the number of them being released. One that I sure hope doesn't become extinct is the split 7". It's always been one of my favorite music listening vessels. Though I love getting split 7"s that have a new band I wasn't familiar with on it, there's something extra fun about a split 7" that has two bands I already know and enjoy. Mandates are first up, off the heels of their recent full length album. Their song "Sycophantic Romantic" picks up where their last record left off; with fast paced and catchy power pop. A slight coating of glam on the vocals and start/stop guitar riffage in the verse leading up to a bit hook with stuttering vocals in the chorus. Mother's Children are definitely cut from the same cloth as Mandates. They serve up their own power pop masterpiece with "No Rules." To me, Mother's Children are a bit more subtle with their hooks and are not quite as in your face as Mandates can be. Their song is probably my favorite of the two on this 7" and stacks up easily with anything the band has released in the past.